That funky bit inside the if statement is a conditional compliation trigger, which will cause these lines to run only for Internet Explorer. Finally, this last piece hooks everything up when the page loads. 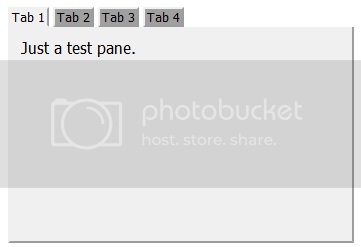 Clicking on the tabs shows the associated panel and triggers any onchange event on the tabpanel element. The default styles are fairly plain (intentionally so), but just like any other element can be overridden by a style sheet or inline style declarations. The propriety of adding custom elements to an HTML document like this may be debatable, but there are places where this technique could certainly be extremely useful.